I finally did it. I repainted - replacing the yellow with neutral white - then I decided not to hang my artwork. It looked too busy and distracting. Looks good. Bright, cheery and very functional. Dale, that a really nice, big, and bright room! Happy Painting. Looking good Dale. I can't imagine my space without the paintings on the walls. Possibly I like being distracted. Thanks for posting the photo. I am fascinated by other peoples' setups. Yours looks cozy and well lit! Wonderful studio! I love the bright white. Looks to be a great place to get inspired. Thanks Janet. I would love it if we could compile the photos of studios with out text or comments just for viewing altogether. Dale, that's a great idea! I don't have pics yet but I'll take some this weekend if I have time. 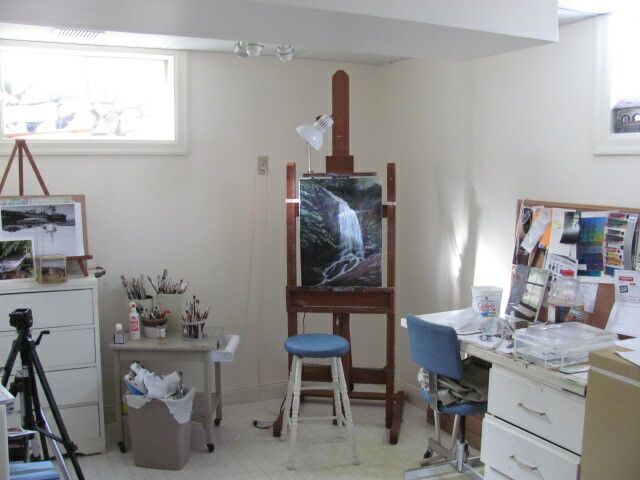 I can ask Helen for permission to photograph her work area too. We work next to each otehr but have different setups. ceiling first to avoid drips on anything finished below it. I guess I'm going to have to clean up my work area before I photograph it. It teds to get pretty disorganized as I work. First stage for me would be to hang drywall through the basement. We've been postposing that, since we are still deciding how to use the space. The walls are roughed in with studs and basic task lighting ( electrical). But we will get there. White surroundings would sure do the trick in making the studio lighting better and more consistent.